The city is a popular tourist destination, due to its proximity to the Costa del Sol. Many tourists also visit here to see the birthplace of Pablo Picasso. There are very cheap flights to Malaga from countries in Northern Europe, particularly the United Kingdom, Ireland, the Netherlands and Germany. Malaga is really well connected, as a result you can easily reach other well-known cities like Seville, Cordoba and Granada by train, bus or car. A popular walk leads up the hill to the Gibralfaro castle (a Parador), offering extensive views over the city. The castle is next to the Alcazaba, which in turn is next to the inner city of Malaga. By taking the Paseo del Parque, a promenade that runs alongside a park with many palm trees and statues, you can walk to the harbour until you get to Calle Larios, the main commercial street of the city. It is, without any doubt, the most beautiful street in the city. The population of Malaga city was 569,002 as of 2017 estimates, while the population of Malaga province was 1,630,615 in 2017. To point out, it is the fifth largest metropolitan area in Spain. Málaga is surrounded by mountains, lying in the southern base of the Axarquia hills. Additionally, two rivers divide the city, the Guadalmedina – the historic centre is located on its left bank – and the Guadalhorce, which flows west of the city into the Mediterranean. 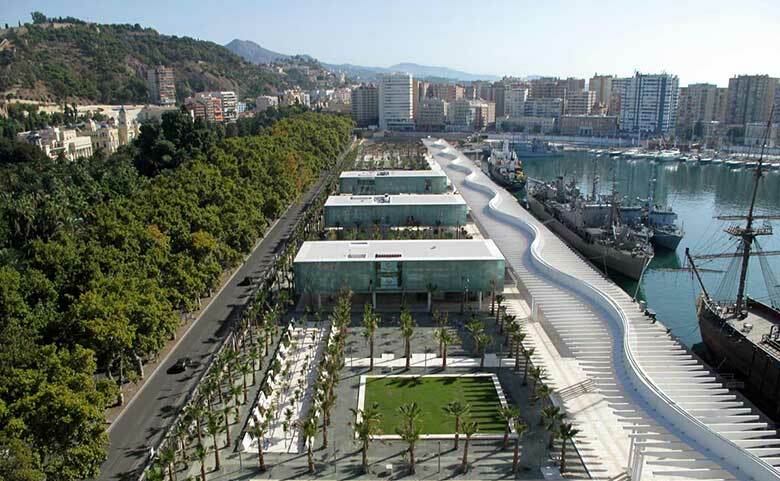 The city is served by Malaga Airport, as well as the cruise port Muelle Uno and the main rail station, Maria Zambrano. The train station is connected with Madrid by the Talgo 200 and the high-speed train AVE. This way, the journey to Madrid takes only two and a half hours. The city also provides two commuter train lines, called Cercanias, and a metro system. There is no train service to Marbella at this moment, but you can always hire a car at Malaga airport. The bus is one of the main means of transport around the city, aside from the underground. You can reach the city center from the bus station by the bus line number 4, although it is only 10 minutes walk to the Alameda from there. You can buy the tickets directly to the bus driver. In fact, the price is around 1.30€ for normal tickets and 3€ for the airport one. Additionally, there are hop-on hop-off buses which stop in more than 10 popular spots around the city, on the other hand, the tickets cost around 20€.